Butternut squash is a versatile ingredient. Peel, seed and cut into slices or cubes and boil for a quick and easy mashed side dish. Add a little salt and pepper. 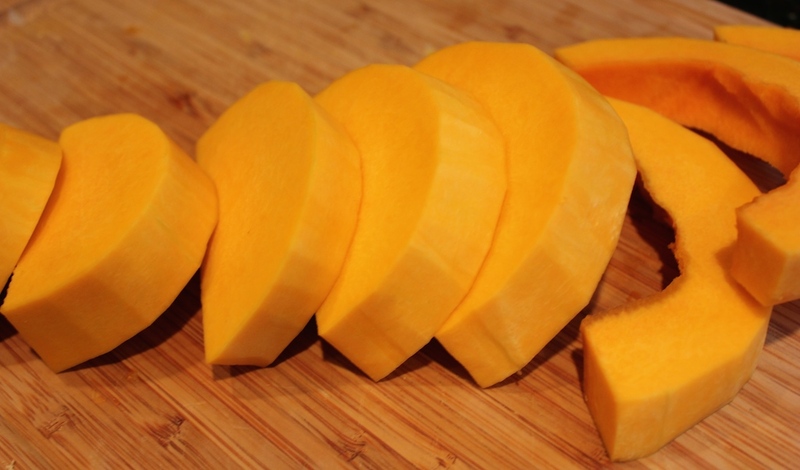 Here’s a primer on how to peel a butternut squash. Don’t be intimated by the tough skin; a good, sharp vegetable peeler does the job. Look for a squash with the stem end still attached and one that is firm and weighty. The outer skin is tough and inedible, but provides a protective coat that allows the squash to be stored in cool, dry spots for weeks, and as a side benefit, it becomes sweeter with storage time. The pear-shaped squash is solid through the neck and the bulbous portion contains a pocket of seeds, which are edible after cleaning and roasting, similar to pumpkin seeds. 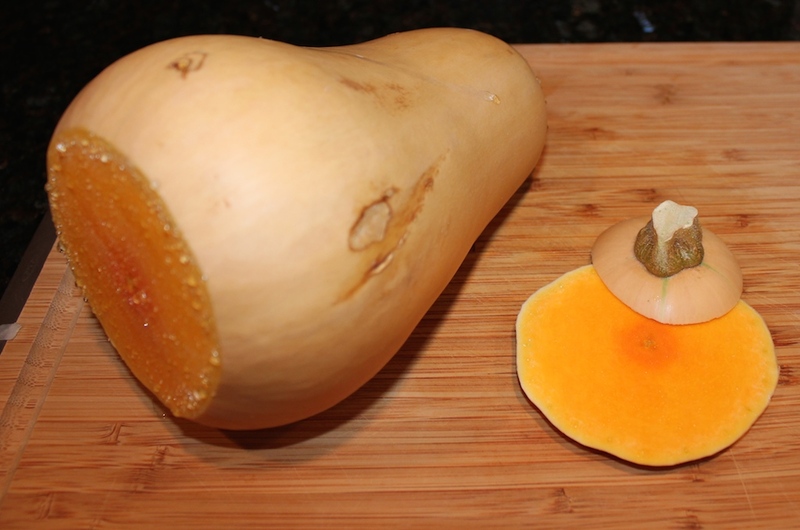 The flesh color is a vibrant golden yellow, rich in carotene, vitamins A and C and the squash is high in fiber. 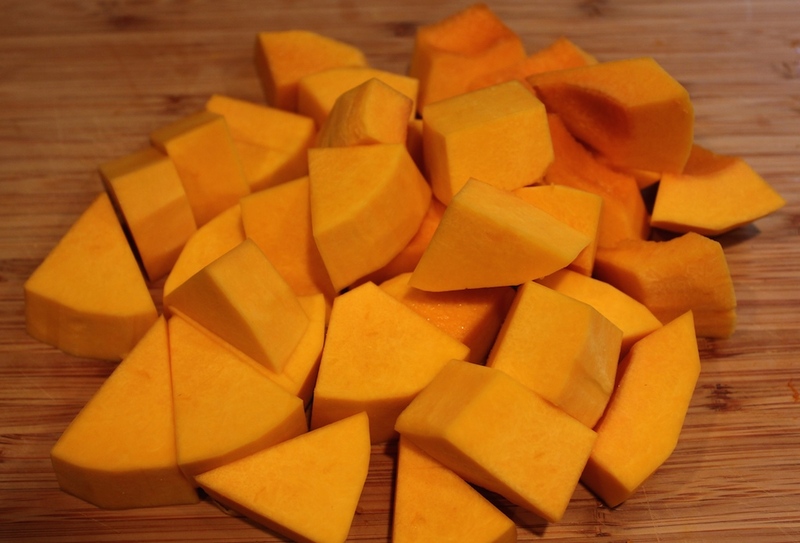 Use peeled, cubed butternut squash in soups, added to stews or tossed with other cut up vegetables, such as red potatoes, shallots, Brussels sprouts, and/or turnips. Toss the vegetables with olive oil, salt and pepper and a herb blend such as herbs de Provence, and roast at 375 degrees F for 40 minutes or until fork tender. Timing varies depending on size of cubed vegetables. See other posts on butternut squash: Roasted Butternut Squash, Curried Butternut Squash Soup, and Curried Butternut Squash Soup with Chicken, Rice and Spinach. Lay the squash on its side. Peel the bulb first, using the neck to hold onto to prevent slipping. Peel the bottom skin off by cutting away the rim with a vegetable peeler. Keep going around and around until you get to the neck. 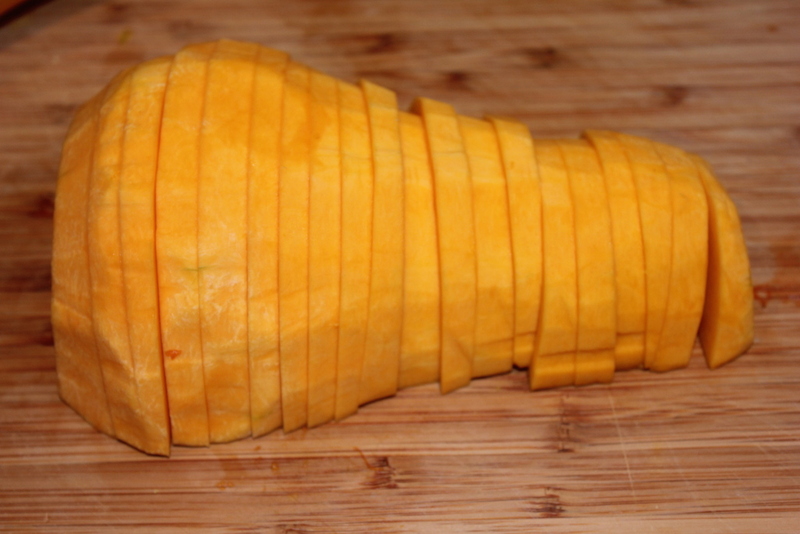 Peel the neck in long, straight lines and then go over the whole squash to remove any green lines. The squash should be bright yellow; if not you have not peeled enough away. Use a paper towel to hold the bulb if it’s too slippery. 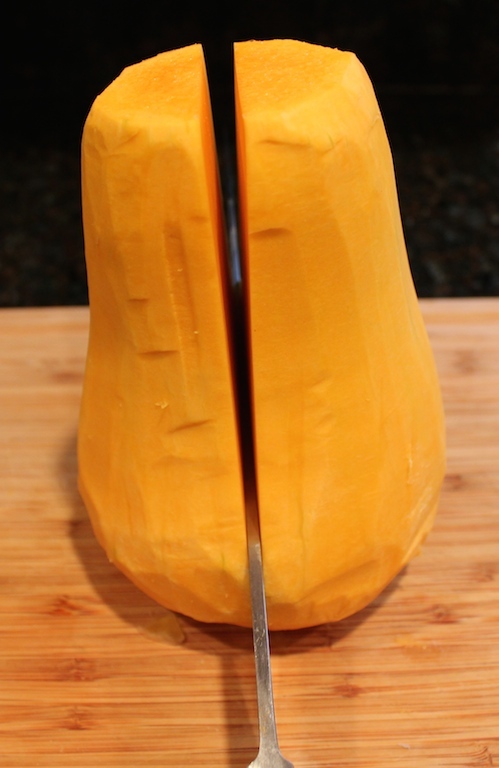 Stand the squash up on its wide bottom and with a sharp chef’s knife slice the squash in half lengthwise. 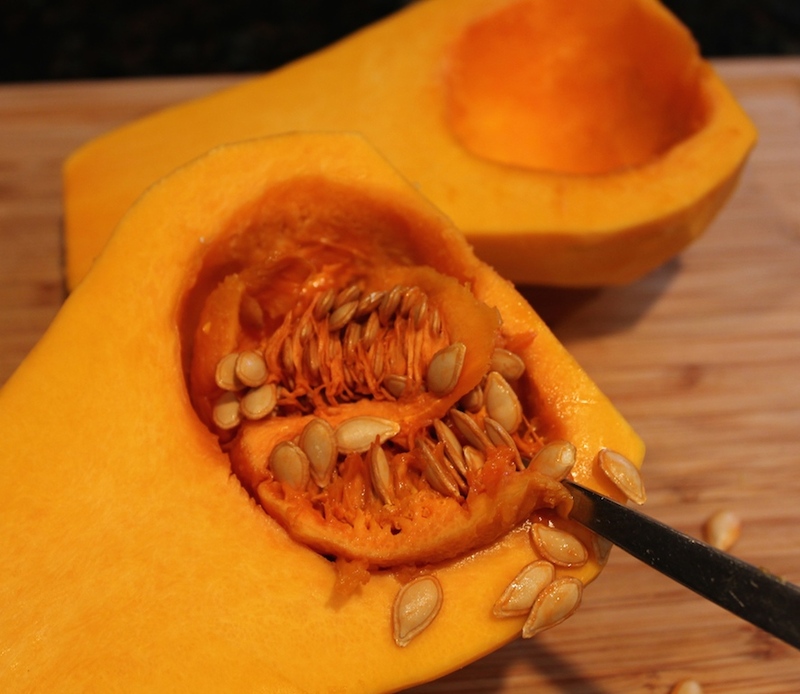 Lie the squash flat with the cut side up and use a soup spoon to scoop out the seeds. Flip the squash over onto the cut side. Thinly slice crosswise into approximately 1/4 – 1/2 inch thick slices. Then cut lengthwise into similar-sized cubes. Slice crosswise into one-inch slices. Then cut each slice three or four times to get similar-sized pieces. 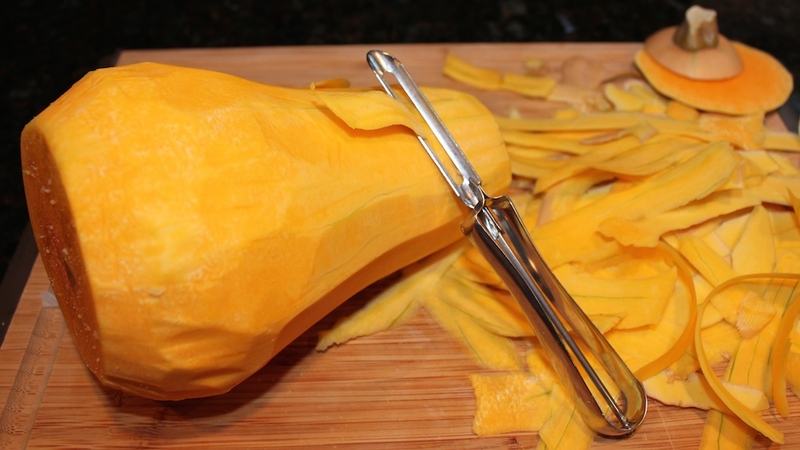 Follow these step-by-step instructions to peel and seed a butternut squash. Wash and dry the squash, then cut off the top and bottom. Notice the moisture beads on the bottom of the squash? That’s why we’ll start by removing the bottom skin first; holding onto the neck with the skin intact is less slippery. Lay the squash on its side, hold it by the neck and peel the bottom skin off by cutting away the rim with a vegetable peeler. Keep going around and around until you get to the neck. 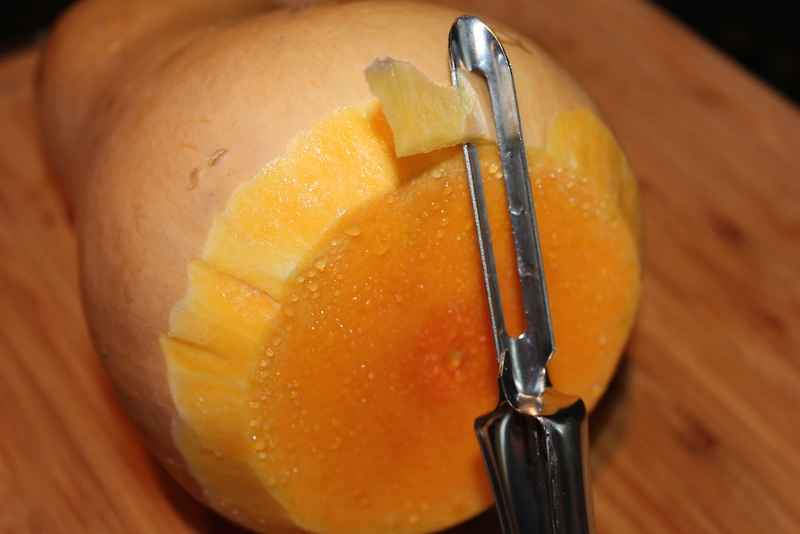 Lie the squash flat with the cut side up and use a soupspoon to scoop out the seeds. 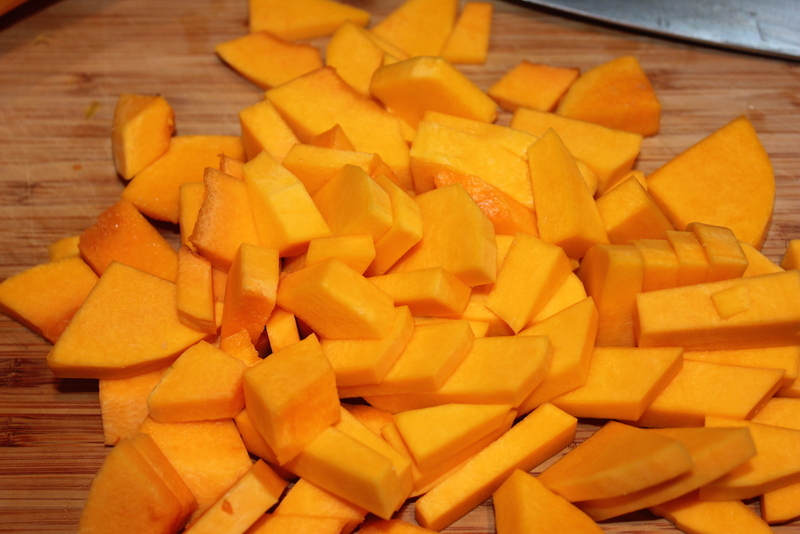 Cut small pieces for boiling and puréeing: Flip the squash over onto the cut side. Thinly slice crosswise into approximately 1/4 – 1/2 inch thick slices. Then cut lengthwise into similar-sized cubes. Cut larger pieces for roasting: Slice crosswise into one-inch slices. Then cut each slice three or four times to get similar-sized pieces.